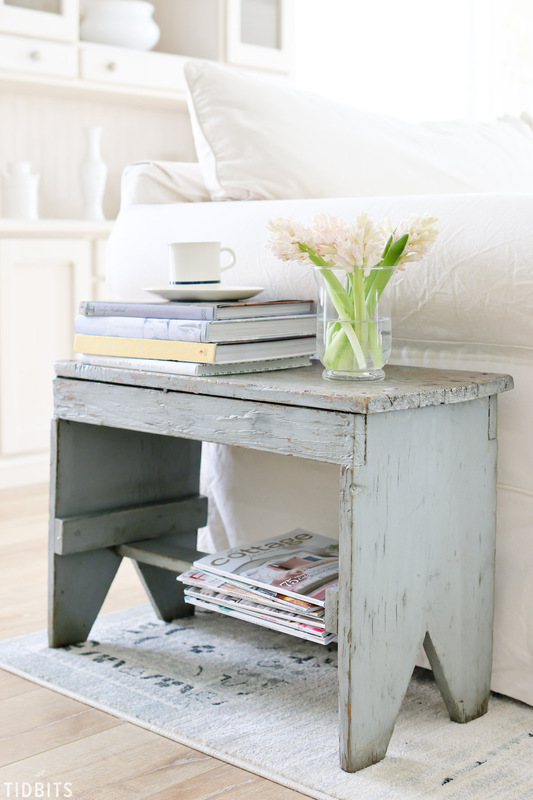 Whether it’s a thrift store find, or an oldie sitting around your house, just about any piece of furniture can transform with paint! 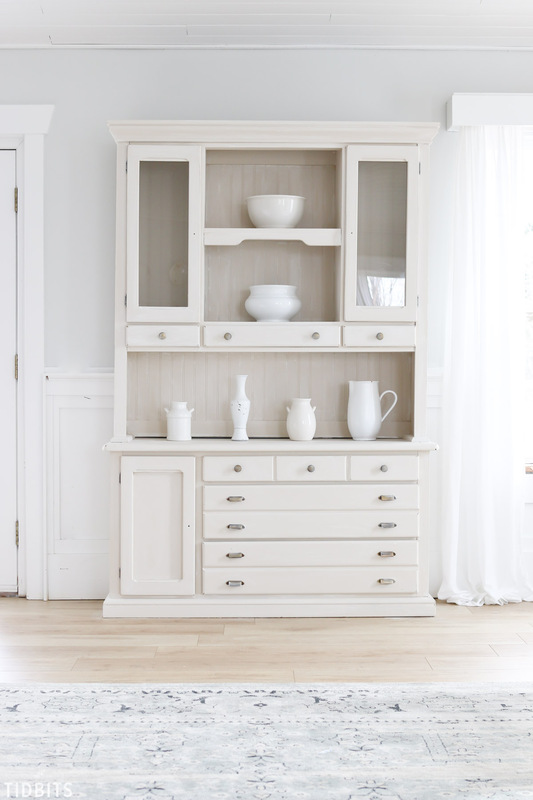 See the before and after of our painted hutch makeover. 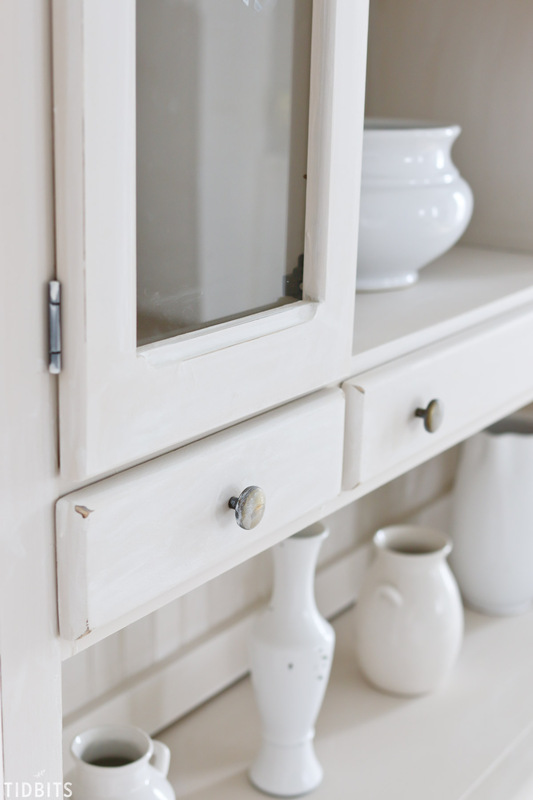 This painted hutch makeover is less of a tutorial, and more of a before/after inspiration for you. It was a spur of the moment project and I got just a wee bit anxious to see it transform. This big ol’ girl had been sitting in our basement storage for 2+ years. I bought it thrifting long ago and knew some day she could be beautiful, but the poor thing got buried under other to-do’s. Off to the nearest home improvement store I went (which happened to be a local ACE hardware store), and I grabbed a new kind of paint I had yet to try. Another stunning transformation with the help of paint! The paint I used is from Amy Howard at Home and it is called “One Step paint”. Have you ever used it? It said no standing or stripping needed, so I didn’t do a thing before I slapped the paint on, other than ask the hubs to put some beadboard onto the backing. 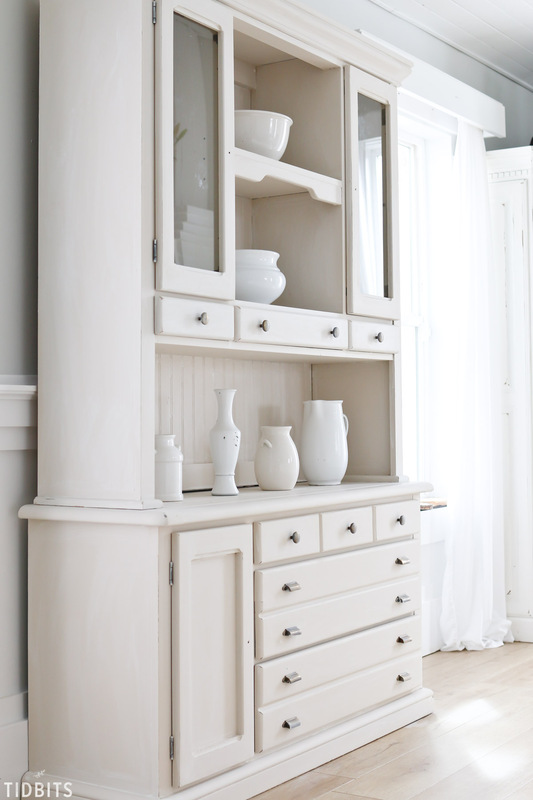 This paint dries to a chalky finish, and this water based paint did a wonderful job with coverage in 2-3 coats. I used the color “Linen”, which is a nice warm white or you might call it a very light brown. I finished it up by trying out some watered down Amy Howard milk paint and white washed the whole thing, followed by rubbing the white paint off with a rag. 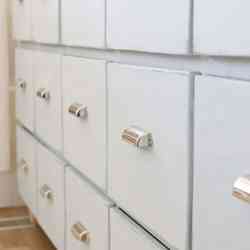 I even white washed the brassy hardware to make it a more subtle contrast. I wanted a very light scuff on this piece, so I sanded the corners and edges lightly. Typically, you finish painted pieces with a sealer, but I am really enjoying the very matted look for now. 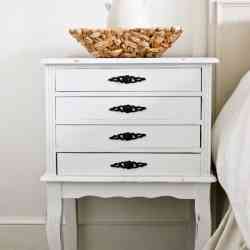 I did however buy this Amy Howard sealer to give it a try on some chippy paint antique pieces I have. It did a beautiful job on this chippy bench I found at an antique store. It made it feel smoother to the touch, kept a nice matte look, and made it less of a sliver hazard. 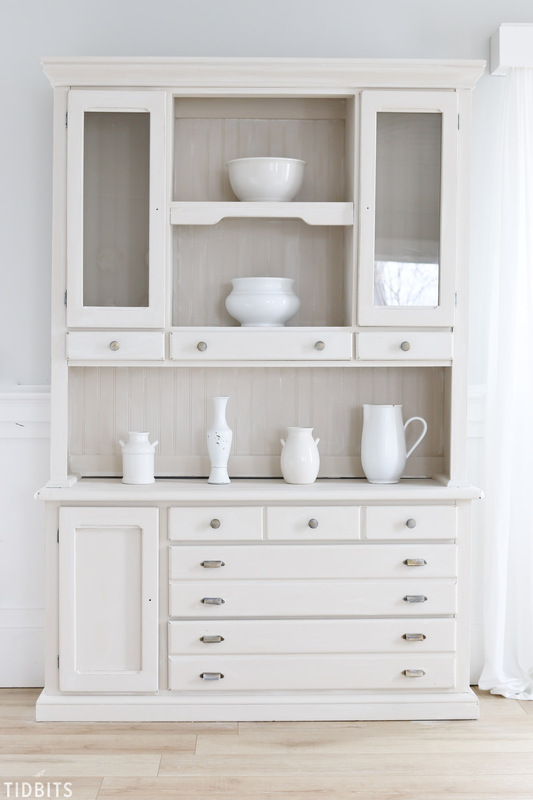 My styling for the hutch was kept very simple with white thrifted vases and bowls. I have 4 kids so I never spend much on breakable decor. 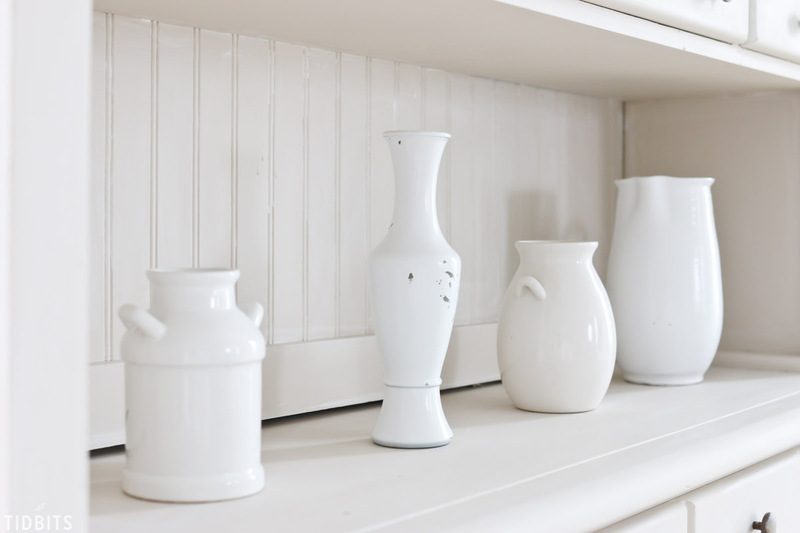 In fact, each vase below was .50 cents or less, and 2 of them I actually spray painted white. They have served me well for years. 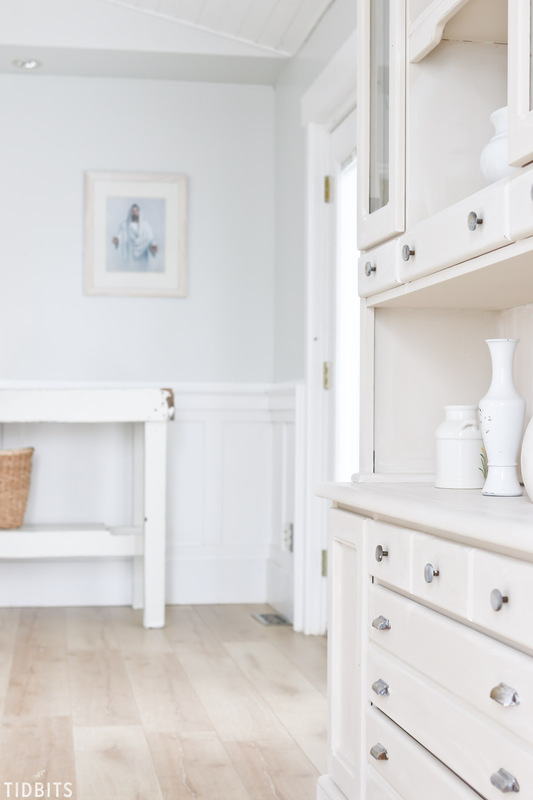 I’ll be showing you more of my living room refreshed for the Spring season very soon, but this painted hutch is a nice new addition and much needed toy storage. 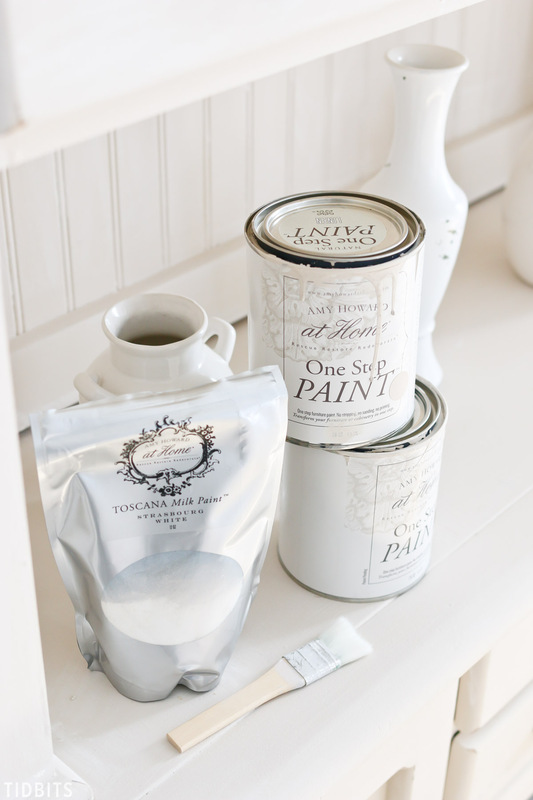 What is your favorite paint to use to transform furniture? I’d love to know! I’m so glad you were able to make it work for your home–much better served there than in the basement covered in “stuff”. 🙂 It looks like a heavy duty, sturdy piece, unlike a lot of furniture, so it will do well for you for years and most likely hold up to kids using it. It looks really great in your living room, and I can see why you didn’t want it there in all it’s natural wood glory when everything around it would be generally white . . . . . . your work paid off and it seems a natural addition to your home. Jennifer, Jennifer. Your comment almost brought me to tears and filled my heart with such gratitude to have you follow along and take the time to leave that comment for me. It was so insightful and thought provoking, it should be a blog post!! I actually 100% agree with you about natural raw wood in all its beauty. My hubs is a lover of raw wood as well and I try to incorporate it but do find a hard time with getting affordable pieces that will give me that raw wood look. Yes, the affordable ones are pressed wood, laminate or other highly varnished pieces. I actually tried to sand a corner of this piece first to see if I could pull it back to raw wood and have it look good, but I knew instantly it wouldn’t work. But old raw wood with white dishes on display – be still my heart! But how grateful I am that I could take the cost of some paint to completely fit this piece with my home, and I agree with you completely. 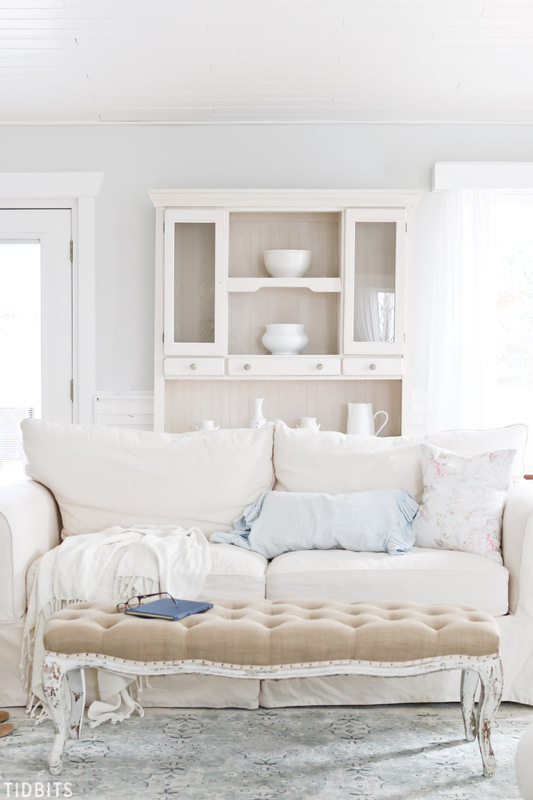 It takes time and work to curate a home, and it just so happens that the painted furniture fits my style and budget . . .or my budget created my style. Hmmm? Being a blogger, it is always a blessing to get sponsored work and have the help to pull together a space, and I’m grateful for the opportunity to help my family in that way. But I started this blog long ago with next to nothing to work with and the desire to inspire others to DIY and create surroundings they love no matter their situation is my foundation. What you said about encouraging others meant so much to me and fueled my fire once again. Your words spoke to the core of my purpose here and I can’t thank you enough for reminding me of that. Wish you a lovely day and thank you for making mine wonderful!!! Hugs! Wow. Those oak pieces abound and I’m always amazed at how paint transforms them. I haven’t tried this brand yet but I would like to. I usually use ASCP or make my own chalk paint with flat latex. As a total aside, looking at your clean space and others around the web, makes me want to start getting rid of the knick-knacks I’ve gathered over the years. Too much clutter! I’m learning less is more! Have a great day. Hope everyone is well now. Yes, they are everywhere! I actually haven’t tried ASCP yet, but I’m making my way through them. 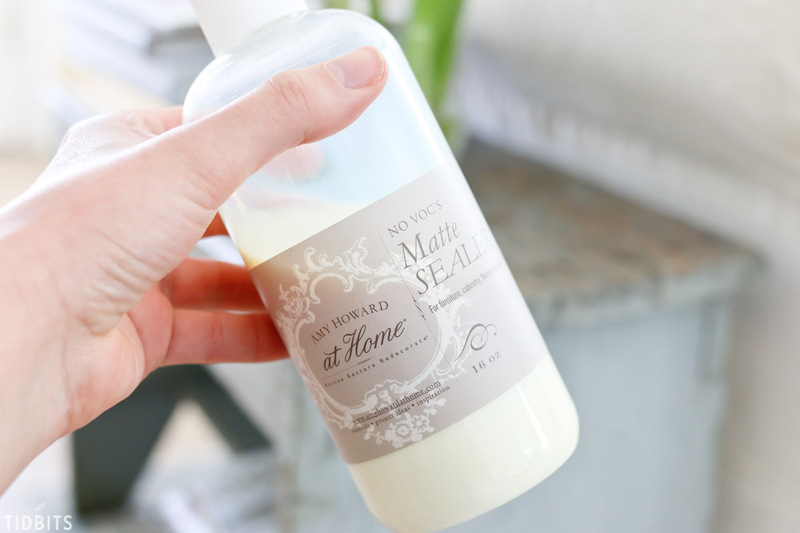 I’ve also made my own chalk paint several times and it does the job! Less is more is a lesson I continue to learn over and over. There is always something laying around that I could probably do without. Have a great day too Cecilia! Hugs back at ya! Thank you! Glad you could stop by! That is just wonderful! I, too, have so many of those oak pieces and have always hesitated to paint over beautiful wood — you may have inspired me to try it! Thanks! It’s sometimes painful to paint over the wood, but I have yet to regret it once that paint is on! Hope you give it a try and thanks for coming by Susan! I love the transformation! 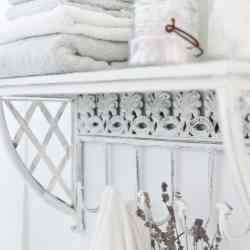 I have used Amy Howard Linen and loved it. Can you tell me the color on the wall behind your hutch? It is so pretty and calming. Is it the same color of your kitchen and/or bedroom? Keep giving us inspiration….you are very talented! Thank you for your sweet words Mary! I sure can. The color is Benjamin Moore, “sterling” half tinted. 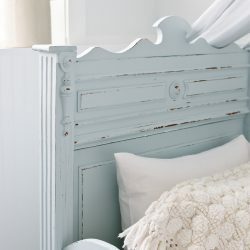 I have a whole post on my paint colors here: https://www.tidbits-cami.com/light-and-bright-cottage-paint-colors/ . Hope that helps! 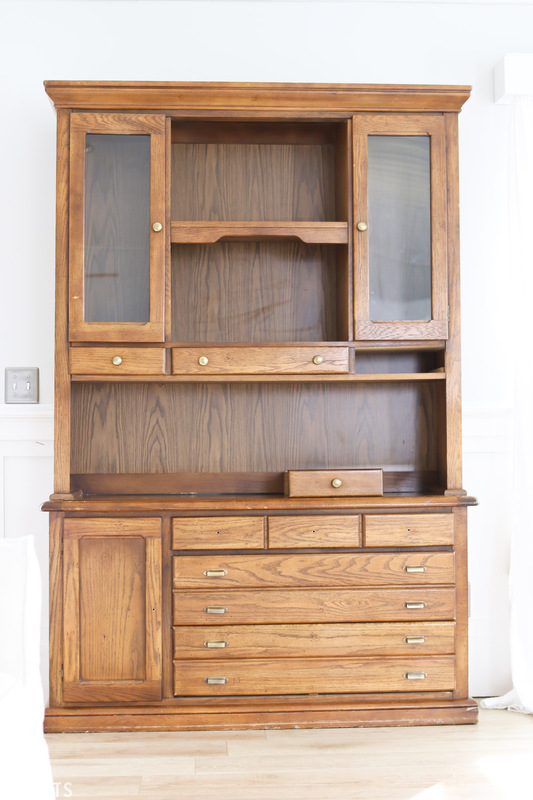 Amazing what a coat of paint can do – so glad hubby didn’t take it back to the store. It looks great, the sort of thing I love to do too. Thank you Sandra! I’m glad he didn’t either, though I was about to be rid of it too because of how long it had sat. So glad I took the painted plunge! It is a beauty and you have done an excellent job. The transformation is so soft and cheery. Love the color. Can’t go wrong with white. And the knobs are perfect. I love how you’re not afraid to tackle large projects like that. I’m more of an uh, no thanks kinda girl. You inspire me! I almost let it intimidate me! It was a beast! I had to slap on a quick strip to convince myself there was no going back now 😉 . Thanks for stopping by! I had to laugh over Mr TIDBITS wanting to take that furniture back to the thrift store. Years ago I rescued an old rocking chair and a round side table that had been in my Grandmother’s abandoned house. Both were in a bad state. My husband threatened to burn them! Over my dead body I screamed!! As they were very old, now probably well over 100 years old I got them professionally restored which husband thought was a total waste of money until he found what they were worth! Somehow that changed his mind. A while ago I found a drawer unit on the side of the road for free. Wood, stickers all over it, handles missing but a solid piece. 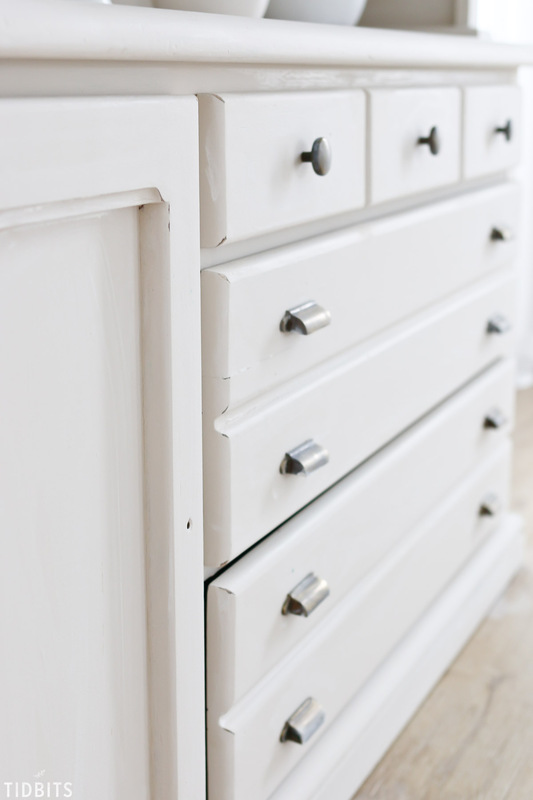 I sanded the drawers, polished them and now intend to paint the other parts. It’s new home will be in the bedroom. Love your blog. I too am loath to dismiss an unloved piece. I couldn’t hardly blame him, I had let it sit for so long. I think he knew the threat would make me do something about it 😉 . I love that you’ve seen the beauty in so many unwanted items. I think it is a gift 😉 . So glad you could come by and thank you for the sweet words! I love how vibrant and clean the new paint is! I have been trying to tell my parents that they should try this sort of things for ages, will definitely share your article with them! Well completely flattered you would take the time to comment to me! Glad you liked it that much!! !